Minoxidil appears to work by affecting the length of the hair growth cycle. The hair growth cycle is comprised of specific stages: the anagen, catagen and telogen phases. The anagen phase is the active growing phase; the catagen phase is the resting phase when the hair is present but is not actively growing; and the telogen phase is when the hair sheds. 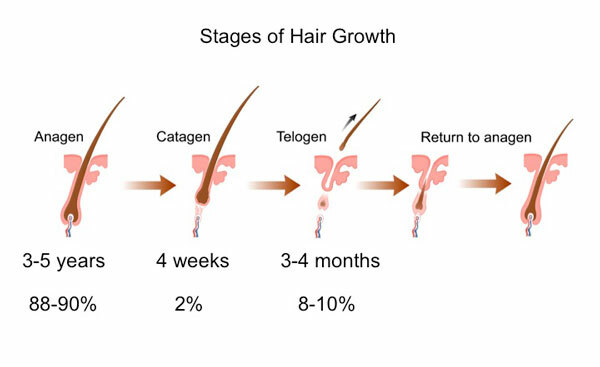 During the telogen phase, there is a usually a 3-4 month time period before hair growth resumes. When your hair is thinning or you’re experiencing hair loss, the length of time in the anagen phase decreases, and time in the telogen phase increases. This means you are losing hair faster than the rate of regrowth. When hair is thinning and the hair does grow back, it often grows back thinner. 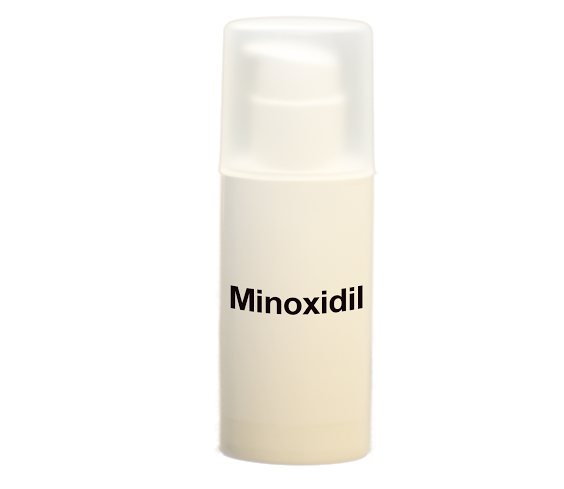 Minoxidil is an over-the-counter topical medication available under different brands names. Some medical practices offer higher concentrations of minoxidil in custom formulations. Minoxidil appears to help hair loss by prolonging the active growth period or the anagen phase, which means that the hairs that are progressively thinning grow for a longer period of time, and delays the hair from shedding or entering the telogen phase. This results in the hair remaining on the scalp longer before shedding. This effect of delaying hair shedding, and prolonging hair growth improves scalp coverage. Minoxidil does not block dihydrotestosterone or DHT which is often an important variable contributing to hair thinning in men who are sensitive to DHT. The benefits of minoxidil on the hair growth and shedding cycle decreases as hair loss continues. 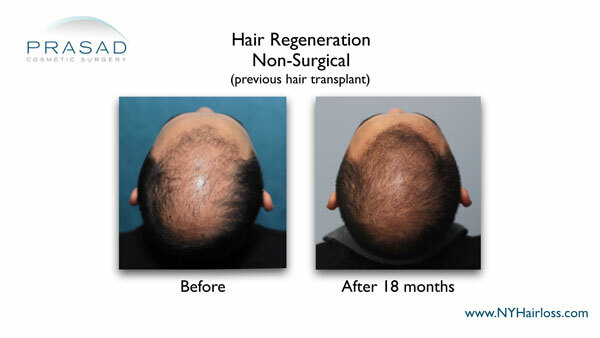 During hair transplant surgery, hair is harvested from the genetically resistant zone or donor area. Typically, a certain percentage of hair grafts don’t grow. In addition, in an FUE (follicular unit extraction) procedure, there’s a loss involved due to transection which occurs when the graft is harvested but the root is left behind. In FUE surgery, approximately 30% of hairs become transected, which means that those hairs don’t have a root and cannot grow. 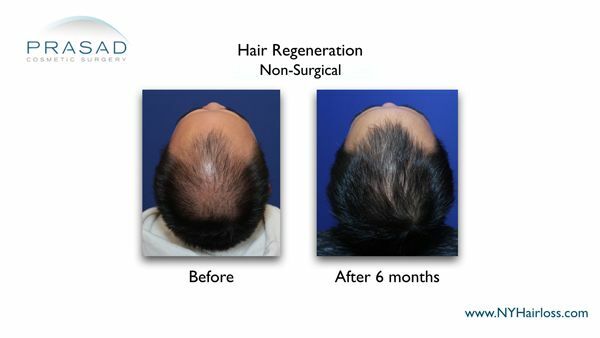 TrichoStem Hair Regeneration can improve scalp coverage by thickening native hair, and improve coverage for people who previously had hair transplant surgery. Minoxidil can provide some benefit in helping men and women experiencing hair thinning. For men, finasteride is more effective as it decreases DHT (dihydrotestosterone) which allows more effective prolongation of the hair growth cycle. Finasteride is not generally effective for women with hair loss. 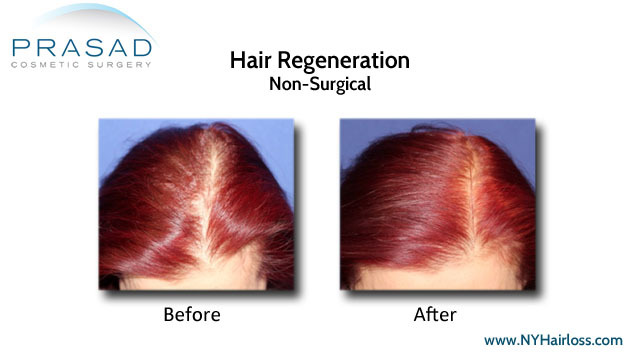 TrichoStem Hair Regeneration treatment has been effective for both men and women with hair loss.